Anyone who has got around the "but they're a Punk band" label that adheres to Stiff Little Fingers and seen them live will be well aware that they're a cracking live act. The Punk label was really only appropriate for a few early albums anyway. What emerged from those early days was a Rock band with great melody, an unflinching attitude and some of the best lyrics around. Add to this a guaranteed satisfactory live experience every time and you can see why they've outlasted their contemporaries and still play sell-out tours. This DVD and concert has special significance to the band as it captures the 25th straight year they have played at the Glasgow Barrowlands on St Patrick's Day. As such, not only do you get the full concert but there's also a decent documentary on the history of the venue and the band's connection to it. The concert itself is an hour and a half of some of the group's best-loved tunes (depending on what your own opinion is, of course) and whilst there's no flash, bang or wallop, the sound quality is excellent and the band are on top form. Jake Burns' distinctive voice delivers his unmistakable lyrics with passion, and you always feel he's happy if just one audience member is educated and fired up by some of the injustice he sings about. It's a shame they still ignore albums such as 'Hope Street' and 'Tinderbox' when it comes to performing live, but at least more recent material like 'Strummerville', 'Guitar & Drum', 'Guilty As Sin' and 'My Dark Places' stop the gig from being a complete retro-fest. 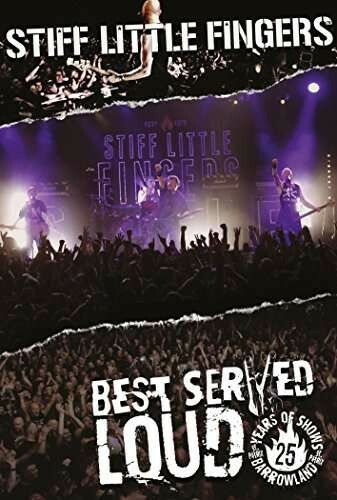 'Best Served Loud' sums up Stiff Little Fingers perfectly. Guitars, drums, bass and vocals come at you with a dedication and intensity that many bands never match, and the power of the songs meanings are still relevant, in some cases thirty odd years after they were written. The attitude is Punk, the music is Rock and the band aren't going away yet, so here's to the next twenty-five years at the Barrowlands.